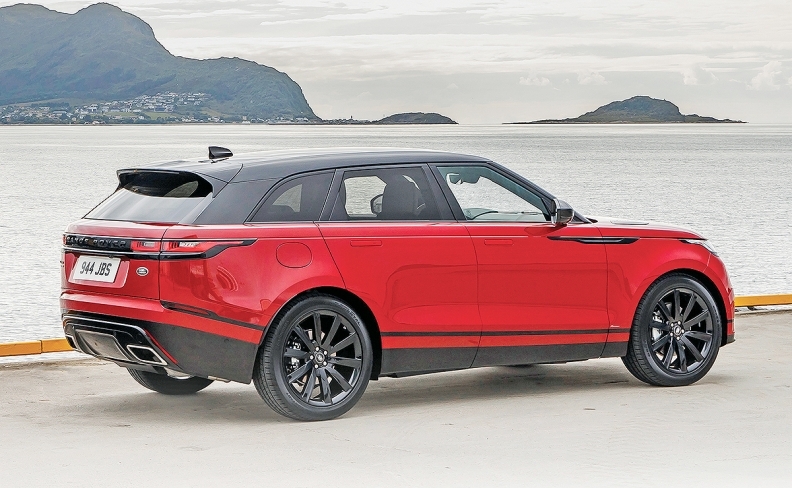 Today's two-tone paint trend includes the Range Rover Velar. PARIS — Two-tone paint jobs, last seen hanging out at drive-ins across the U.S. in the 1950s, are back, this time with a distinct European flair. In the past several years, about 20 models with the feature, largely with bodies and roofs in different colors, have hit showrooms across Europe, with more poised to come. So far the look is largely confined to compact hatchbacks and the surging SUV and crossover market. Automakers say they are simply trying to give customers more choices, though the options typically appear as part of higher-content (and higher-priced) trim levels. Designers say it lets them play with color as a styling element and break up visual mass as safety regulations mandate thicker pillars and higher beltlines. "Designers are cooking with the ingredients they have," said J Mays, retired head of design at Ford who oversaw the Ford Flex, one of the few U.S. nameplates with a contrasting roof option. "You can get a lot of bang for the buck out of two-tone paint." Buyers of Citroen's new C3 Aircross SUV, for example, can mix and match three roof colors and eight body colors. "It's incredible how people react to the bitone colors," said Alexandre Malval, head of design at Citroen, which offers two-tone options on four models. "If you give them two colors to assemble, immediately the car has different personalities. Red with a white roof is a little bit sporty; cream with a black roof is a little more solid and tough. One in pastel with a white roof could be a little more feminine." The trend is not exclusive to Europe. In the U.S., two-tone versions of the Toyota Camry and C-HR have turned up this year. Also, several Land Rover Range Rover models and Kia's Soul are available as two-tone models, as will be Hyundai's upcoming Kona. Today's two-tone palette can be traced to the 1920s and '30s, when custom coachmakers employed bold colors on Rolls-Royces or Bugattis to announce the wealth and taste of their owners. In the 1950s, American design studios, led by Harley Earl at General Motors, adopted bold swaths of color divided by chrome trim lines to emphasize dynamic jet-age styling. The current trend was kicked off by the neo-retro Mini that debuted in 2001, which picked up its white roof from the original Alec Issigonis design. One of its successors was the white-roofed Ford Fairlane concept of 2005, which went into production as the Flex. "I would be lying if I said I wasn't influenced by the first-generation New Mini, which had beautiful wraparound glass and this lovely little skullcap in white and later in black," Mays said. The Flex's white roof "added a little bit of panache to the car and made it feel a bit like a modern-day woody, which is what we were trying to do," he added. "I think it influenced a lot of other manufacturers," Mays said. "Some of them are quite successful, and some are really terrible, but everyone seems to have jumped on that bandwagon." Two-tone designs can serve several goals. From a utilitarian standpoint, a white roof can reduce interior temperatures, as on the original Land Rover. Visually, a contrasting roof color can reduce the bulk of a crossover or SUV. "What we did on the Flex, and what Gerry McGovern has done on the Land Rover Velar, with a dark roof and dark tinted glass, is to effectively chop the car in half and eliminate the extra mass on the top," Mays said. Sally Erickson Wilson, an associate professor in design at the College for Creative Studies in Detroit, said colors have started to play a new role in automotive design. "We are in the midst of a shift to material-led design, where the choice of the color can emphasize craftsmanship and the perceived quality of an area of the vehicle," she said. "It's all about paying attention to detail," Erickson Wilson added. "Color can make something seem more luxurious or more functional." In today's automated and hyperefficient factories, painting a car two colors can add cost and complexity, automotive coatings suppliers said. "Bitone paint finishes are always more labor intensive because of the masking they require," a spokeswoman from Axalta Coating Systems in Switzerland said. "That means the need for more people, which in turn can mean the potential for mistakes." Mark Gutjahr, BASF's head of automotive color design for Europe, said the process generally involves painting the entire shell in body color and clear coat, then masking off with foil any parts that will remain in that color. A second color is applied, flashed off and clear coated, then the foil is removed. The second color is applied either in a second line, which means additional investment, or on a second run in the main line, which reduces capacity, Gutjahr said. Those are trade-offs that automakers are willing to accept as they seek to improve pricing across their range. Two-tone designs are often part of a higher-trim package that can boost the price of a car by thousands of euros or dollars. "The demand is much higher than we thought," said Matthew Harrison, vice president of sales and marketing at Toyota Motors Europe, which offers two-tone options on the Aygo, Yaris, Auris and C-HR. "One of our headaches is keeping up with the bitone trend. We're having to constantly argue with manufacturing to raise the production capacity levels." Robin Page, senior vice president of design at Volvo Cars, said the new XC40 crossover, which goes on sale next year, was designed from the start to have different roof colors. "If you look back at vintage cars, they used to play with two tones, but this is done in a really modern way and it does change the character," Page said. "The XC40 was definitely a car where we said, 'OK, we'd love to have the R-Design versions with a black roof and the Momentum trim line with a white roof.' "
The European champions for customization might be the Opel Adam supermini, which offers at least seven roof colors and 19 body colors, and the Renault Captur subcompact crossover, with four roof colors and 11 body colors. "When you've got so many combinations of roofs and paint tones, it's pretty involving to the customer," said Stewart Reed, chairman of the Transportation Design Department at Art Center College of Design in Pasadena, California. "It's like going into a home furnishing store and picking out textiles and materials for floor coverings and countertops. People love choices." The two-tone trend probably has a few years left. A number of models, including the Volkswagen T-Roc, Seat Arona, Opel Grandland X, Kia Stonic and Hyundai Kona have not yet officially debuted or are just reaching the markets. Carmakers and suppliers continue to experiment with different processes, including printing and the use of different finishes such as matte and gloss in the same color. "There are future possibilities that will enable this trend to become bigger," said BASF's Gutjahr. As to when it will end? "Ubiquity usually relegates everything to the trash bin," Mays said. "The companies that have this as part of their brand DNA like Mini or Land Rover, it won't go out of style." Ultimately, he said, "It's going to be one of those things you look back on in 10 years' time and say, 'Oh yeah, that was from that era right around 2016-2017 when everybody seemed to be doing two-tone.'"